The Vintage Athlete of the Month for August proved that race didn’t matter as the first great African American catcher in Major League Baseball while winning three Most Valuable Player Awards during a decade with the Brooklyn Dodgers. With 398 home runs and two MVP Awards, would Dale Murphy had made the Hall of Fame if it hadn’t been for the Steroid era? In a year in which baseball’s all-time leader in home runs, a member of the prestigious 3,000 hit club and the winner of 354 games on the mound are all eligible for the Baseball Hall of Fame for the first time, not a single modern-era player will receive baseball’s greatest honor during the annual induction ceremony on Sunday. To honor this auspicious occasion, Sports Then and Now is recognizing five baseball players that we believe have legitimate claims to being in the Hall of Fame and who very likely might have received the “call to the Hall” years ago had not a generation of players totally changed the perception of offensive production. 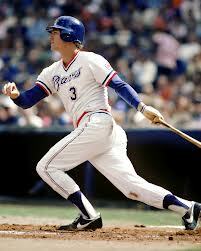 When Dale Murphy retired from baseball in 1993 the PED era in baseball was just getting started. By the time he became eligible for the HOF ballot in 1999, Mark McGwire and Sammy Sosa had made a mockery of the single season home run record and Murphy’s career total of 398 home runs and top season of 44 dingers were no longer particularly impressive. Editor’s Note: In honor of today being the 65th anniversary of Jackie Robinson breaking baseball’s color barrier I am reprinting an article I originally published in recognition of the anniversary a year ago. I am learning that one difficult challenge of being a parent is explaining to our children pieces from past history that are inconsistent with how we want them to think and experience daily life. Recently my five-year-old son and I were watching a section from the wonderful Ken Burns Baseball documentary. The section first focused about baseball during World War II and then about Jackie Robinson breaking the color barrier in 1947. Because he is growing up in a time and culture where racism isn’t a noticeable part of daily life and he has been fortunate in his short life to meet and regularly interact with many people from all backgrounds and races, it was very difficult for him to grasp that there was a time in our country when discrimination was part of the norm in certain places and where not everyone was given the same opportunities. 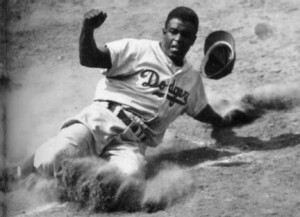 While trying to give him enough information to explain why Jackie Robinson was a special person and should be celebrated, I found myself focusing on how great Robinson was as a player, rather than simply focusing on his crucial role in breaking racial barriers. Not that I was trying to shield him from the ugly elements of America’s past, but rather because it was easier for him to understand and because what I want him to know as he moves forward with his own life is that people are judged and celebrated for their achievements, performance and success and that skin color isn’t an important part of that equation. When you think about it, that is probably one of the greatest components of Jackie Robinson’s legacy. He paved the way for us to be able to judge greatness not based on ethnicity or race, but instead on how someone performs in whatever area in which they participate. 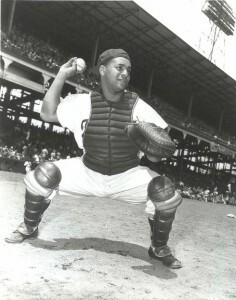 It was 64 years ago today that Robinson played his first game as a member of the Brooklyn Dodgers. The future Hall of Famer didn’t get a hit that afternoon, but his mere presence forever changed professional baseball and American society. Tags: Brooklyn DodgersJackie RobinsonMartin Luther King Jr. 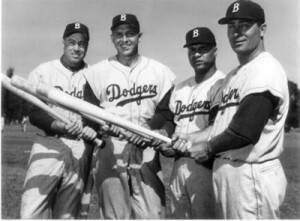 Despite having many of the top stars in Major League Baseballs, the Brooklyn Dodgers won only one World Series title. Now that the 2011-12 NBA season will happen, sports prognosticators will return to projecting how many championships the Miami Heat will win. Forget about the disappointment of last season — this team has more than enough talent to bring home at least a few Larry O’Brien Trophies, right? That’s what people were saying about the Lakers in the ’60s, Mets in the ’80s, and Mariners in the ’90s (different trophies for the latter two, of course), yet they wound up with just two championships between them when all was said and done. The following would-be dynasties failed to meet expectations for a multitude of reasons — including injuries, team chemistry problems, free agency, drugs, and even a strike — leaving fans wondering what might have been had things gone a little differently. Even if the Dodgers had won multiple World Series titles during this era, the franchise would’ve been more remembered for its role in integrating baseball by signing and promoting Jackie Robinson. 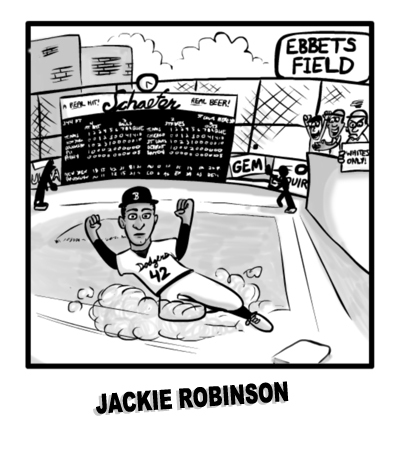 More than just an inspiring figure in the Civil Rights Movement, Robinson was an ideal second baseman with tremendous speed, excellent contact ability, and exemplary defense. He played alongside Hall of Famers Roy Campanella, Duke Snider, Pee Wee Reese, Don Drysdale, and Sandy Koufax, one of the most talent-rich rosters in baseball history. From 1947 to 1956, the team won six NL pennants and the 1955 World Series, a resume worthy of NL dynasty status, but not MLB dynasty status. 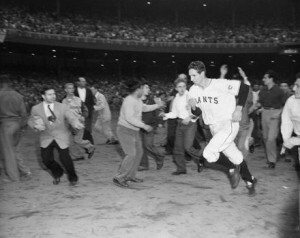 Bobby Thomson raced around the bases and into baseball immortality with his pennant-winning home run in 1951. Sixty years before Evan Longoria’s home run lifted the Tampa Bay Rays into the baseball playoffs and completed the greatest September rally in baseball history, there was another home run that completed another improbable comeback. It was on October 3, 1951 that Bobby Thomson blasted the “Shot Heard ‘Round the World” that lifted the New York Giants into the 1951 World Series. The 1951 National League playoff race was to its generation what the 1978 Yankees-Red Sox race was to fans 27 years later and the September Wild Card rally of the Rays and Cardinals to current fans. The Dodgers led the Giants by 13 games on August 11th, only to watch the lead disintegrate over the final seven weeks as Brooklyn went 26-22 in their final 48 regular season games.